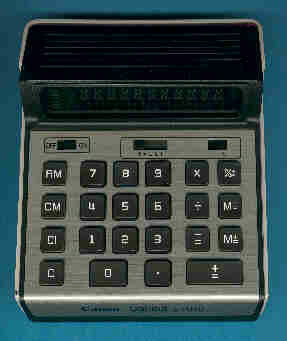 The Canon Canola L1010 is another calculator based on the TMS1000 Microcomputer family. The ZA0552 found inside the L1010 seems to be a member of the TMS1270 and is similar to the calculator circuit of the TI-5200. We know the ZA0552 already from the Palmtronic LD-10M introduced in 1975. A similar housing was used with the Canola L812 ann the later L813. Don't miss the LC1014 using the early yellow LCD display. © Joerg Woerner, December 21, 2002. No reprints without written permission.